Can better tackling technique make football safer? In Part II of WTOP's "Bad Brains" special report on football's concussion crisis, sports editor Noah Frank explores how new developments in technique are trying to reduce head contact in the sport. This is the second part in WTOP’s “Bad Brains” special report examining brain injuries in football, what doctors know about them and what’s being done to make the game safer. The tag line for the technique training program Safe Football, the brainchild of former NFL lineman Scott Peters, is as ominous as it is simple. The declaration begs the follow-up question, though, one that seems to be at the forefront of every debate about concussions and brain injury in the game: Does football need saving? More than 142,000 youth and high school coaches became certified in Heads Up Football — the program the NFL encourages through USA Football — in 2016. The program is a comprehensive safety system for coaches that addresses far more than simply brain injury. It teaches protocol in important areas, including heat preparedness and hydration, as well as sudden cardiac arrest — responses to real-world deaths that continue to plague the football world. It also includes a concussion protocol for dealing with players suffering from brain injury. But its biggest selling point is arguably its technique component, offering a high school or youth football tackle certification program for coaches (for $10 or $25, respectively). With a name like “Heads Up,” there seems an implicit suggestion that the program exists, at least in part, to address the sport’s concussion crisis. To that end, USA Football touted the Heads Up system as having reduced concussions 28 percent in its first year, a seemingly strong start in the right direction. Except the data was misleading, according to The New York Times. Additionally, the initial version of the course itself seemed to do little to actually address the most fundamental, pressing concern of how to avoid head contact, and therefore brain injury, when making tackles. USA Football rebutted the Times report with updated data, stating a 43.3 percent decline in concussions at Fairfax County Public Schools in the first two years of using Heads Up. Nevertheless, the organization implemented a bevy of sweeping changes this year, from reducing the amount of players on the field, to eliminating potentially dangerous special team plays, to even advancing a modified tackle version of the game first introduced in 2015. Editor’s Note: Peters clarified that he supports USA Football’s mission to create a safer sport and the Hawk/shoulder tackle technique they now teach. But this year, USA Football made a more dramatic change to the tackling system itself, implementing the shoulder tackling technique taught by Rocky Seto, the former USC and Seattle Seahawks coach who brought rugby-style tackling to head coach Pete Carroll’s teams. 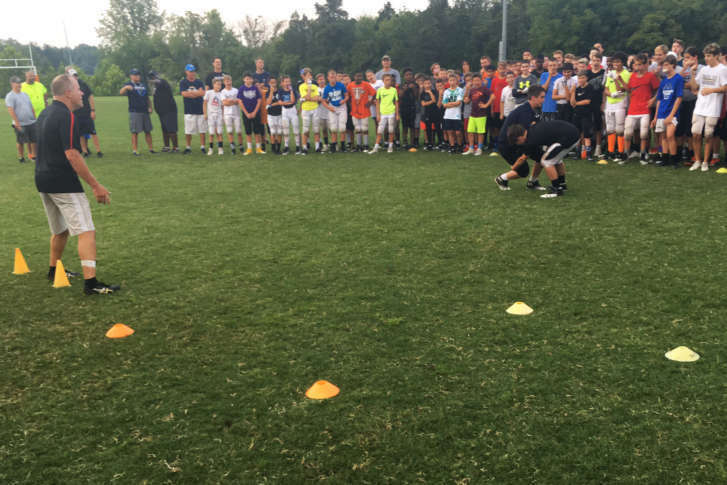 Those techniques were embraced and practiced in a first-of-its-kind joint effort between USA Rugby and USA Football on a field in Loudoun County, Virginia, in the weeks before the 2017 football season. Fraine had the added advantage of Carl Opauski, president for Central Loudoun Youth Football League, deciding to enroll his kids in rugby a few years ago. The two became friends, opening the door for discussions about potentially bringing some of that rugby-style technique to the football field. After some preliminary clinics last year, they decided to hold a leaguewide session heading into the 2017 season. To help his messaging land with a group of kids who might have been skeptical, Fraine borrowed liberally not just from Seto’s drills, but also his vocabulary. “Leverage is power,” Fraine shouted as he demonstrated techniques. “It’s like wrestling,” a parent watching from the sideline said under his breath. Fraine dubs the style “Heads Out,” a noteworthy juxtaposition to Heads Up. The mechanics of the tackle involve closing the near shoulder to the ball-carrier’s near hip — the head never coming into the range of the tackle — splitting the opponent’s feet with the lead foot, driving the shoulder into the soft part of the body (between the chest and hips), then wrapping the legs from behind the knees, pulling the cleats off the turf to make the tackle. “I kind of fashioned what they did, their techniques, the languages they spoke and the situations they put their players in, and I tried to mimic that with what I know,” said Fraine. Of course, the players aren’t the only ones who need to buy in or, arguably, even the most important. If a coach doesn’t believe wholeheartedly in something, he’s not going to be an effective teacher. It’s understandable that after playing and teaching one way their entire lives, coaches like Opauski and others at the clinic might be resistant to an overhaul in the fundamental philosophy of the game. It’s easy to see why. In the first drill, with no helmet or pads, two of the rugby players execute a full-speed, full-contact tackle that elicits a group-wide reaction of awe from the roughly 120 football players in attendance. Both players hop back to their feet, uninjured, ready for another rep.
A parent of kids involved in youth rugby, Fraine knows the safety issue remains paramount for parents. If the players learn a more effective, less risky technique at the lower levels, Fraine hopes they will expect to see it taught when they reach high school and college, a sort of trickling up the football ecosystem. Of course, tackling doesn’t address the full issue of head contact. Bone-rattling hits make for both eye-catching highlight tapes and attention-grabbing source material for concussion alarmists, depending on which side of the argument one sits. But as Peters points out, even top tacklers like Hall of Fame NFL linebacker Junior Seau — who suffered from C.T.E. and committed suicide in 2012 — averaged fewer than six tackles per game over his NFL career. The contact goes far beyond where the ball ends up on any given play. “When we talk about concussions in the media, the average fan is thinking about tackling. But really, not every play ends in a tackle, and not every player is involved in that process,” said Peters. That’s why his system focuses so much on both offensive and defensive technique for off-the-ball plays that routinely create head contact. If you could distill the general philosophy down to one core tenet, it would be the use of the hands in front of the body to create space and leverage, generating results without the head ever getting involved. A recent study of a college football lineman showed a specific player absorbing more than 60 collisions equal, on average, to a car crash into a wall at 30 mph. Dr. Shane Caswell, who researches concussions in youth athletes at George Mason University, also found in one of his studies using sensors that the players absorbing the worst contact were the ones in the trenches, along the line. “The linemen, who participate on offensive and defensive line, had the highest frequency and highest magnitude of impacts that were occurring during the games,” said Caswell. That squares with Peters’ experience as both a player and instructor. In many formations, 68 percent of the 22 players on the field reside in the tackle box, with opposing linemen often staring each other down, facemasks just a foot or two apart before the snap. That repetitive head contact is of particular concern when it comes to C.T.E., which appears to result largely not just from what people traditionally think of as a concussion, but from the sub-concussive hits that occur routinely when helmets collide. The issue is even more of a concern at lower levels of the sport, where smaller roster sizes often mean players — particularly linemen —playing both offense and defense, absorbing twice the contact. “We know that the sub-concussive hits are also a major consideration, a major concern or risk factor for C.T.E. So we want to try to mitigate that to the extent we can,” said Peters. That’s why the Safe Football system he has developed in conjunction with other former NFL players focuses first and foremost on avoiding any unnecessary helmet-to-helmet contact. After implementing his techniques as the strength and conditioning coach at the University of Washington in 2012, Peters says the training staff registered zero reported concussions, despite the top rush performance in school history from running back Bishop Sankey, meaning plenty of run plays where head contact is more expected. Safe Football has found success at the prep level as well. In 2015, the 10 schools in the Phoenix Union School District averaged 26 diagnosed concussions per football program, prompting the district athletic director to reach out to Peters. In the first year of a three-year implementation program, that rate dropped all the way down to an average of one per program. Peters has only been able to instruct college coaches, rather than players, due to the NCAA’s restrictions on bringing in outside consultants, even for safety measures. There are strict, 10-man limits on assistant coaches. That means a team would have to forfeit a spot in order to allow Peters to be hired to teach his program directly to student-athletes. The NCAA did not reply to a request for comment regarding these policies. In the meantime, Peters has worked with a handful of NFL teams, including the Washington Redskins this offseason. He’s not waiting for the NFL to enact sweeping reform to get to work at the highest level of the sport. It’s a change he sees as fundamental to football’s future. An earlier version of this piece stated that Peters had worked with the Baltimore Ravens as well this offseason. That has been corrected. Part I: What’s happening to football’s brains? Part III: Can technology save football? Part IV: Can football and its players recover from the concussion crisis?